Sweet Pepper, Tennessee is known for its peppers, its ghosts, and the secrets kept in a small mountain community. 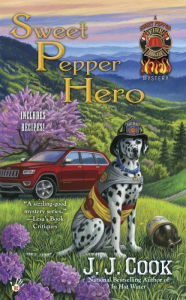 When author J.J. Cook thrusts fire chief Stella Griffin into the middle of local whiskey wars in Sweet Pepper Hero, Stella and the reader discover how explosive mountain secrets can become. Stella's already in hot water. The ghost of the previous fire chief, Eric Gamlyn, has been gone for five months. Not only does she miss her resident ghost, she's not really equipped to take over his job as judge of the recipes for the summer festival. He was quite a cook, and Stella didn't mind taking credit for the dishes he whipped up. Now, she's stuck, so when police chief Don Rogers stops in asking for help in an arson investigation, she's eager to drop her apron. The whiskey wars are heating up. The ATF is cracking down, and when Rogers found an illegal still, the operator was killed and a police officer injured when it blew up. And, that's only the first "accident". It seems there are more illegal stills in Sweet Pepper than Stella would have suspected. But, despite his request for help, Don and the local sheriff seem to have secrets, and, at times they're freezing Stella out of the investigation. When Stella herself becomes a victim of the wars, her volunteers in the Sweet Pepper Fire Brigade rally around her. Stella manages to rescue her ghost, and Eric returns the favor in this action-packed mystery that intensifies quickly. As always, there's ghostly humor amidst the serious business of putting out fires, saving lives, and finding the person behind the exploding stills. But, even as a hero to most in the community, Stella always ends up riling up someone, leaving them to threaten retaliation in an ending that leaves readers wondering. Fire chief Stella Griffin is a tough, determined woman, who has earned the respect of most in the community. She leads a team of heroic volunteers on a daily basis. But, there's an unstable element in town, some who are power hungry, and that adds to the volatile atmosphere. When the whiskey wars are raging in Sweet Pepper, it takes a pair of two cool fire chiefs to uncover the explosive truth. Strong characters, amusing moments, and danger are a recipe for success in J.J. Cook's Sweet Pepper Hero. Add a little whiskey, explosions, fires, and a handsome ghost, and the author distills a smooth read. Sweet Pepper Hero by J.J. Cook. Berkley Prime Crime. 2016. ISBN 9780425279236 (paperback), 294p. This is one of my favorite series. My copy is on it's way from Amazon. Hopefully I'll have it by Wed.
And, I'm hoping it will continue, Sandy, after Joyce's death. You never know, and you don't know if the tone of the book will change. It was so sad to hear about Joyce's passing. Me, too. I don't know what will happen with the books. I never met the Lavenes, so I don't know anything as to their writing format or who did what.